RAB turned me on to this place earlier this week. Going in, I didn't know what to expect but I was really pleased with everything we had, especially the tonkotsu broth of my Chasshu Ramen, which was right up there with some of the better versions I've had. It was creamy and rich, and not overly salty. There was some very beautiful restraint and touch exhibited here. 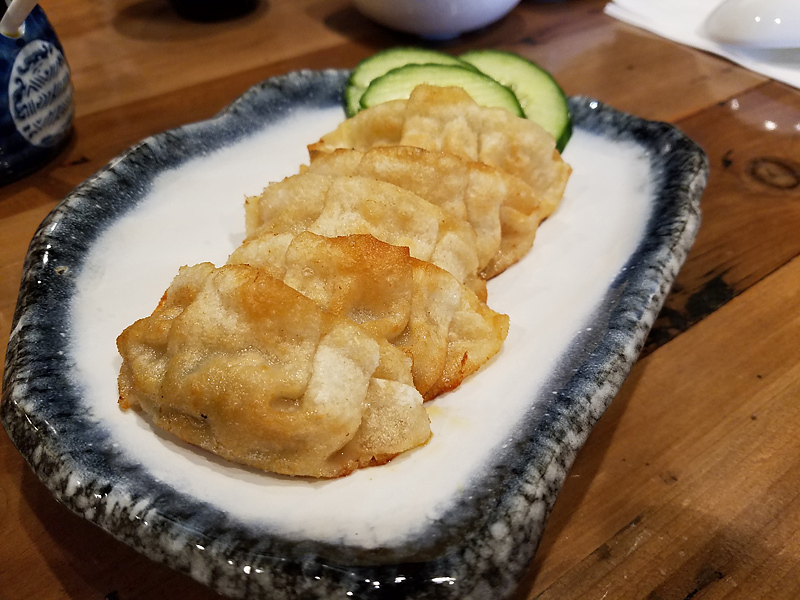 In this, the full-sized version, 4 slices of Chasshu are served. The egg, served whole, was absolutely perfect with a slightly jiggly white and gooey, runny yolk. If I have one minor complaint, it's about noodles themselves. They had a satisfying, chewy texture but were lacking a bit on flavor. Worth noting: this, and all their noodles, are available Spicy, by request. 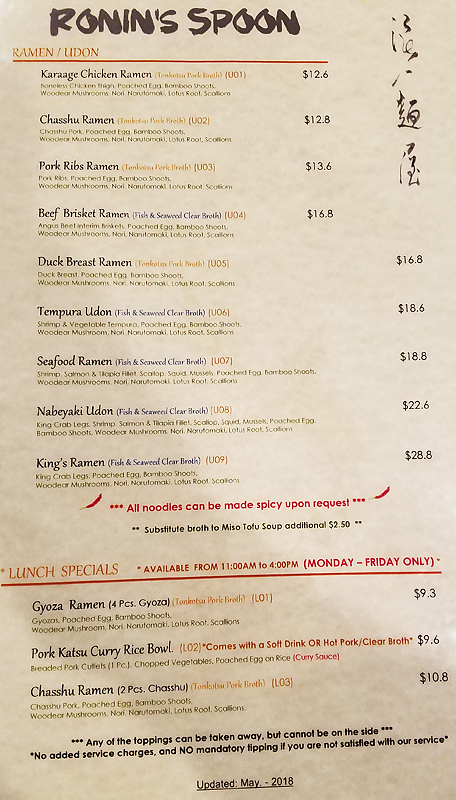 It's enough to expect decent ramen from a ramen place, so I place no expectations -- and very little importance -- on the non-ramen items. However, it was a late lunch and we were particularly hungry, so we tried a few appetizers from the fryer, which were also notably tasty . . . Piping hot, lightly seasoned and delicious. The exteriors were lightly crispy and the meat was moist and flavorful, owing to some sort of very nice marinade/brine. 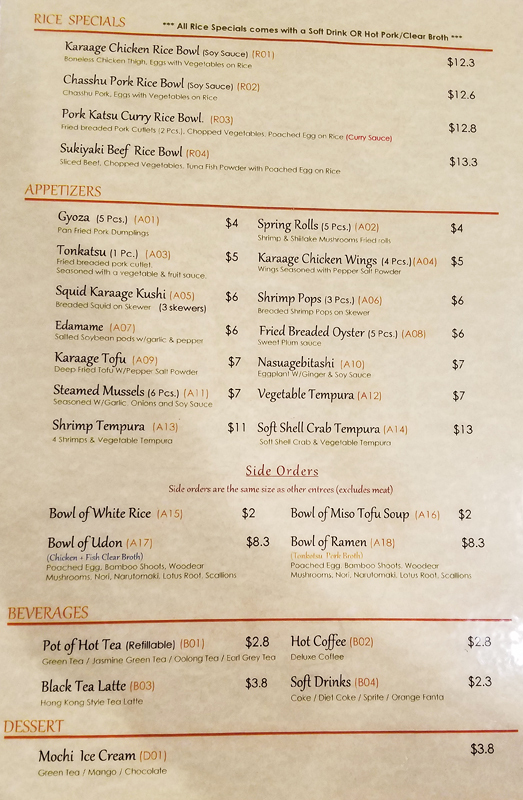 Because their website doesn't seem to offer it, I'm posting some lousy pics of their menu here . . . 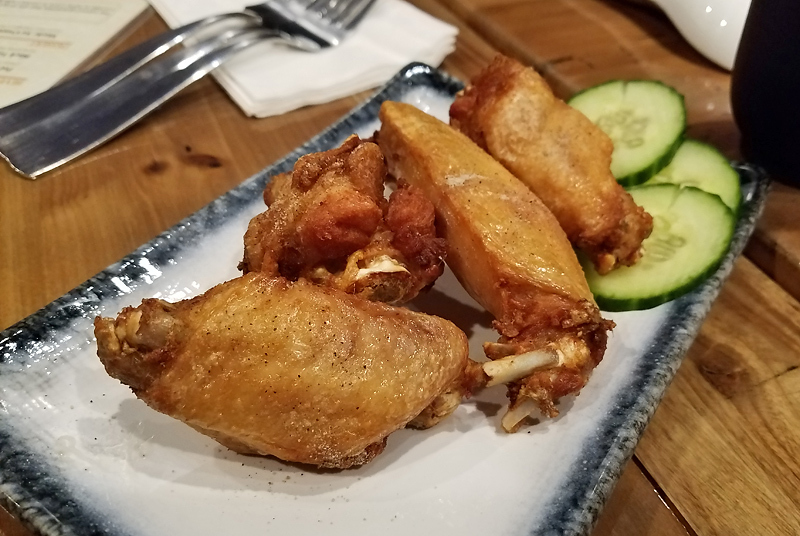 They offer a very potent chili oil, which is used in the Spicy versions of the noodles, and is also available as a condiment that was great with the appetizers. Crowded at lunch time? Because with broth like that, I anticipate long waits like Misoya sometimes has, once it's discovered. I can't say. We arrived just before 2 pm and were the only customers in the place. 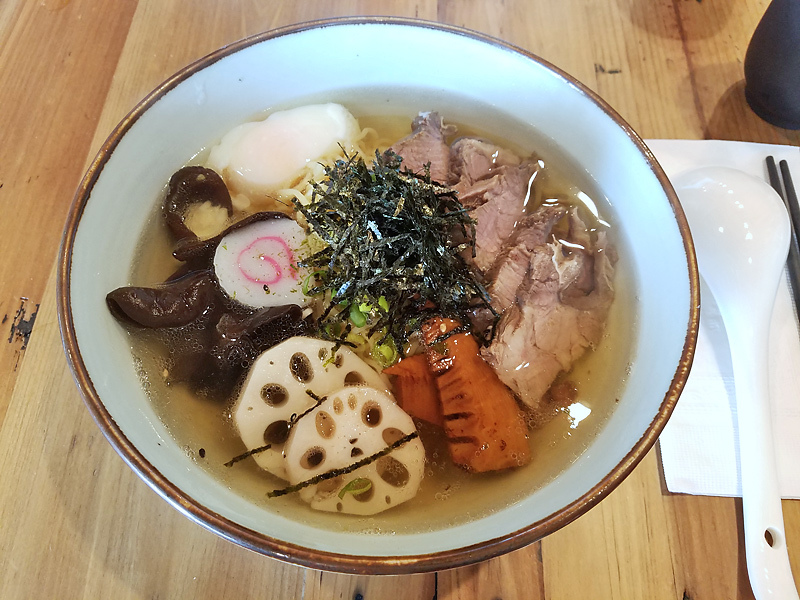 Went back today and tried the Brisket Ramen, which is made with a clear chicken and fish broth . . . I very much enjoyed the clear and ultra-clean broth. It was flavorful, a bit funky and very restrained on the saltiness level and felt to me to be somewhere between dashi and consomme. The other components were nicely prepared, too. It seems they're all cooked to very specific textures and that results in varied and satisfying bites throughout. 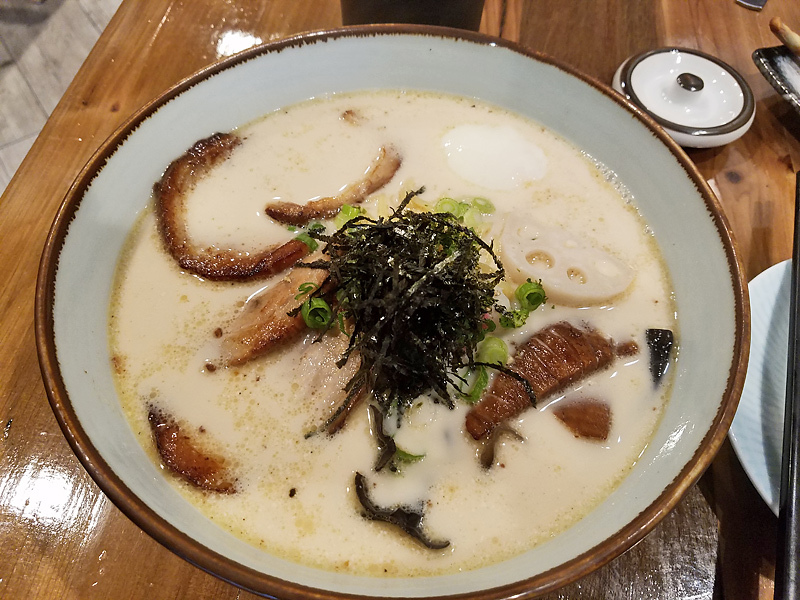 My son ordered one of the Tonkotsu bowls, which I tasted. I thought the broth was even better than at my last visit; redolent of delectable roasted pork. As for crowds -- I imagine there might be if you arrive right at noon. I arrived a little after 12:30, and people were leaving, so I had no trouble getting a table -- though I did have to give them a minute to wipe off one of the recently abandoned tables. Not as close to me as Mitsuwa, but a quieter and lovelier setting (place is beautifully decorated), so this may become my go-to for ramen.